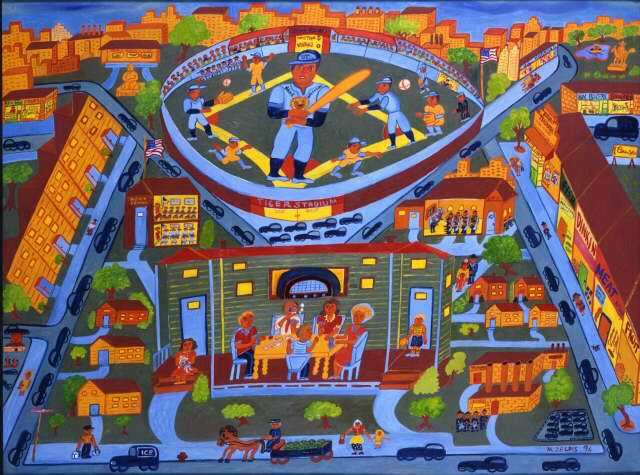 I’m not the biggest fan of folk art, but I must say, the combination of the style with the subject of baseball is perfect. Zeldis’ and Fasanella’s paintings are lovely, interesting and complex. As for your painting, it’s got a quirk to it I just love. When I first saw it, I missed the baseball diamond completely. 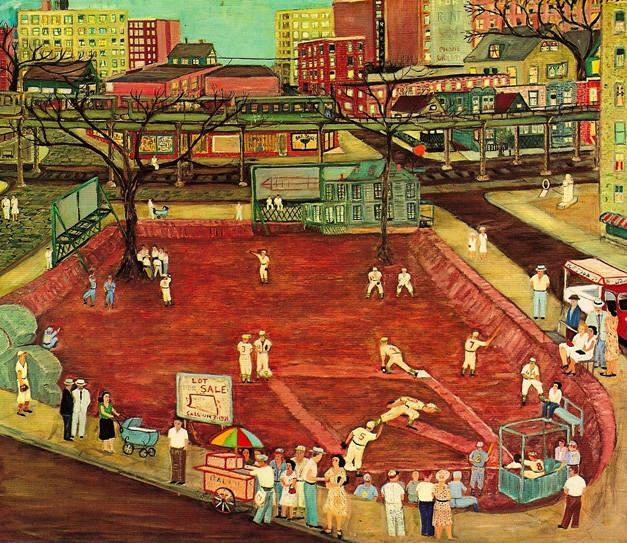 What I saw was a portrait of a baseball player in the midst of the red roofs. See him? He’s facing left, with his nose quite prominent. The baseball diamond itself looked like a batting helmet to me, with his ear beneath the infield. What I saw as an eye is, of course, the bleachers. It’s really a great image. It’s analogous to the Rubin vase phenomenon. Something else you may enjoy is this Norman Rockwell-like photo from opening day, 2009. It’s so purely Rockwell it’s amazing. It’s a great picture but two things are worth noting. Firstly, it’s not a picture from Opening Day, 2009; it’s a picture from Game One of the 2009 World Series. Secondly, and more importantly, credit should be given to the photographer, Elise Amendola of the Associated Press. The confusion was mine. The article I linked at “American Digest” clearly states that the photo’s from Game One of the 2009 series, and Gerard properly links to the WSJ Photo Journal where the original photo is found. I saw Gerard’s Reference to opening day in his title, and simply missed that the photo is from some years earlier. But it’s clear in his piece. Also, I see I messed up my own links here. If you click “Norman Rockwell-like photo”, it will take you to the article with the proper information and attribution. I hadn’t seen the face before. What a great perspective– it reminds me of Charlie Brown’s round head! I love the photo from the World Series and had not seen it before. The expressions on those faces are remarkable and definitely Rockwell-like. Thanks so much for including it! Love this one-went to opening day at Nationals Park and it is becoming more surrounded every day. Are you going to bring this with you at your show in June at The Principal Gallery? Is it for sale? Thank you, Laura. No, this one won’t be at the June show– it sold to a friend in Massachusetts. 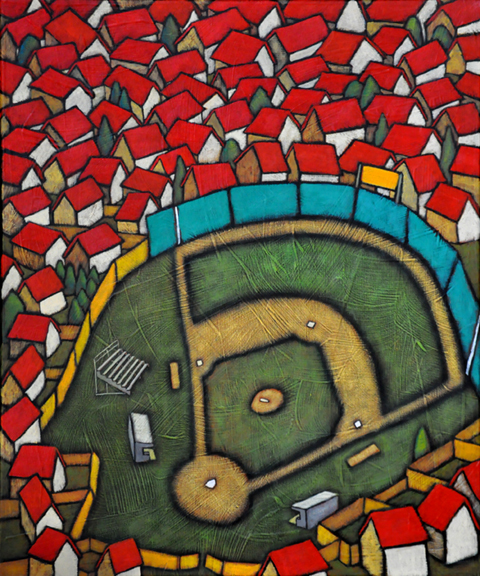 But, based on how well this piece worked, I am considering doing another baseball themed piece or two for the show. Keep an eye out here and I will probably show it at some point. Looking forward to seeing them-thanks.